The Galloping Goose No. 5, owned by the Galloping Goose Historical Society of Dolores, sits on the Durango & Silverton Narrow Gauge Railroad turntable at the roundhouse in 2018. The historic vehicle, which is based in Dolores, will be offering excursions in February on the D&SNG line. For the third consecutive winter, the Dolores-based Galloping Goose No. 5 will run winter excursions up the Animas Valley on the Durango & Silverton Narrow Gauge Railroad. On Feb. 15, the trip will include stops along the way for taking photographs. During the photo stops, passengers temporarily get out at a scenic point and then the Goose backs up and runs forward to create an ideal photo opportunity. On Feb. 18, passengers participate in a rare rail-fan adventure. Half the trip is spent riding the Goose, and the other half of the day is spent on historic rail cars pulled by vintage steam locomotive SP-18, which is visiting from Independence, California. The Dolores-based Galloping Goose No. 5 will run winter excursions through the Animas Valley in February. Tickets, which are $169, can be purchased by calling (877) 872-4607, or at durangotrain.com. 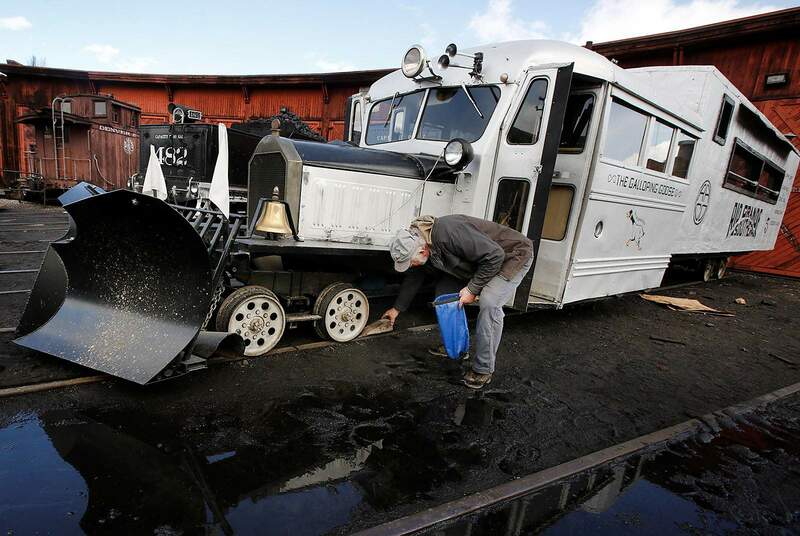 Joe Becker, president of the Galloping Goose Historical Society of Dolores, chocks the wheels on the Galloping Goose No. 5 at the Durango & Silverton Narrow Gauge Railroad Roundhouse in 2018. The trips will include stories of winter travel on the Goose, including a trip from the 1930s where passengers had to jump off into the snowdrifts at Trout Lake after a broken drivetrain severed a brake line. Another story is of a snowbound Galloping Goose that was stranded for three days. Supplies were dropped by an airplane from Cortez, and someone hiked in with additional supplies. Also, on Feb. 20, fifth-graders from the Dolores School District will tour the Durango & Silverton train museum and roundhouse, then enjoy a 1.5-hour ride on Goose No. 5 to Railroad Park and back. John Randall a motorman, looks over the motor in the Galloping Goose No. 5, owned by the Galloping Goose Historical Society of Dolores, in 2018 at the Durango & Silverton Narrow Gauge Railroad Depot. The historic vehicle, which is based in Dolores, will be offering excursions in February. Dolores began as a railroad town in the 1890s and grew up with the Rio Grande Southern Railroad, which extended 160 miles between Ridgway and Durango. The railroad transported ore, lumber and livestock out of remote areas of the San Juan Mountains. In response to severe economic challenges during the Great Depression, motorized rail cars were built in the railroad’s Ridgway shop in the 1930s. The gasoline-operated “Galloping Geese,” as they came to be known, transported passengers, U.S. mail and essential supplies from Durango to Mancos, Dolores and the mountain towns of Rico, Placerville, Telluride and Ridgway. Goose No. 5 was originally built with a 1928 Pierce-Arrow limousine body and running gear. 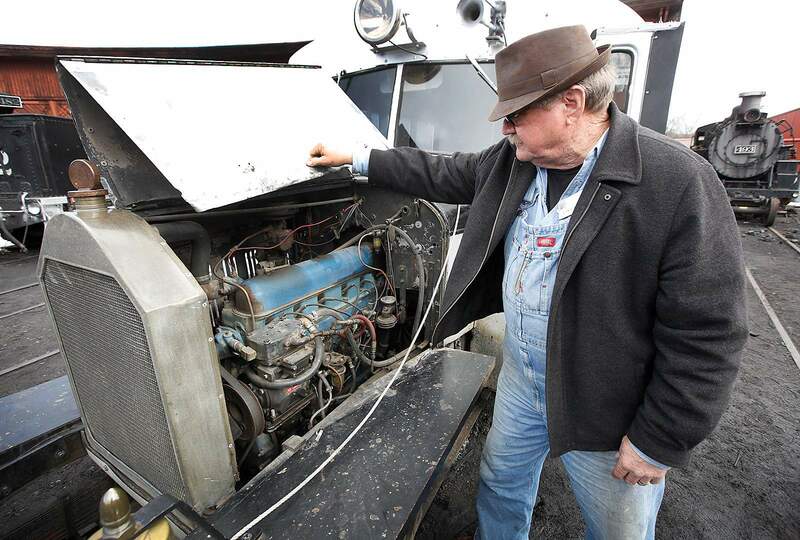 It was rebuilt in 1946-47, using a World War II surplus GMC gasoline truck engine and a Wayne Corp. school bus body. In 1950, the freight-mail compartment was converted to carry 20 additional passengers for sightseeing trips. The Galloping Geese operated for 20 years and kept the Rio Grande Southern Railroad and the area that they served economically viable until the railroad was abandoned in 1952. The Dolores Rotary Club purchased Goose No. 5 in the early 1950s, and it is currently owned by the town of Dolores. The Galloping Goose Historical Society was organized in 1987. Using volunteer labor, the Society built a replica of the Dolores Train Depot in 1991, where the museum, gift store and historical society offices are now located. In the late 1990s, the historical society restored Galloping Goose No. 5. It is open to visitors and runs on track in front of the museum. The restored Goose No. 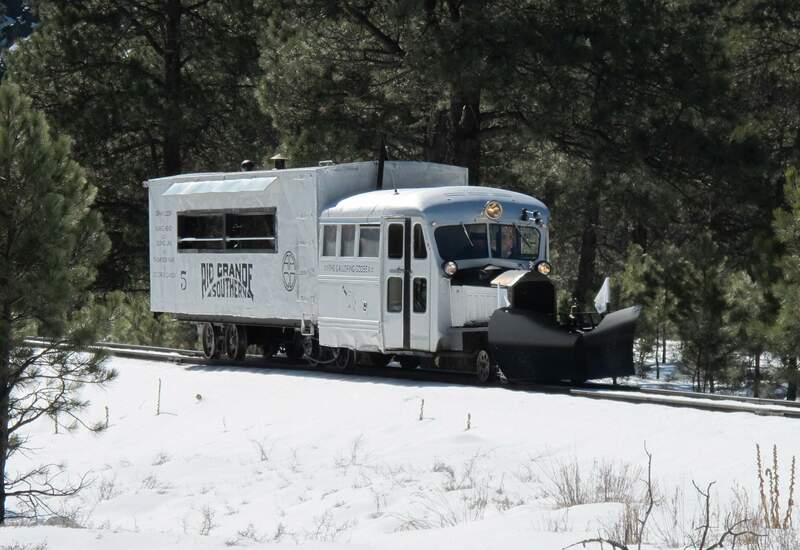 5 is the only Rio Grande Southern motorcar that regularly runs excursions in Colorado and New Mexico.